The ACOG states a 2016 Legislative Priority as being, “Protect the Physician-Patient Relationship”… Oppose state and federal interference in the patient-physician relationship. This is code for DON’T INTERFERE with our current practice of (lack of) consent. The “Essure problem” is NOT just a Conceptus/Bayer/FDA issue…. but also an ACOG issue (American College/Congress of Obstetricians and Gynecologists). 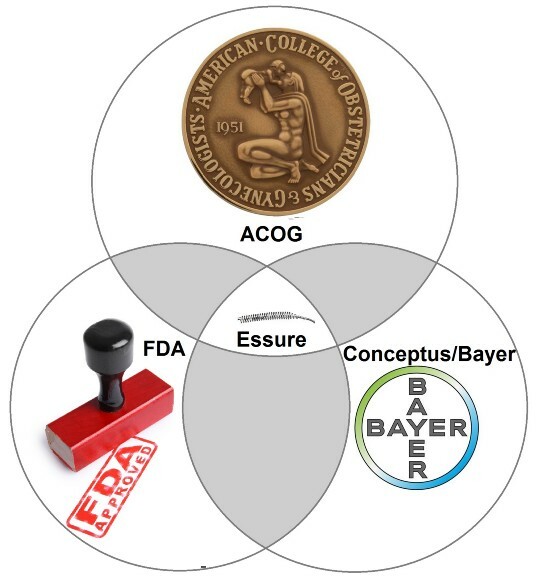 It isn’t Conceptus, Bayer or the FDA who physically inserts the Essure medical devise into women, but ACOG OBGYNs. It is they who were (are) directly involved in the consent / research / development / performing / reporting of procedures/studies. It is the ACOG and their members who promotes this product, profits from it’s sale (and profits from the sequel the device creates). The ACOG and their members are the primary perpetrators in this cycle of abuse and the batteries which are being committed.